Tulle is a versatile, pretty decorating medium. 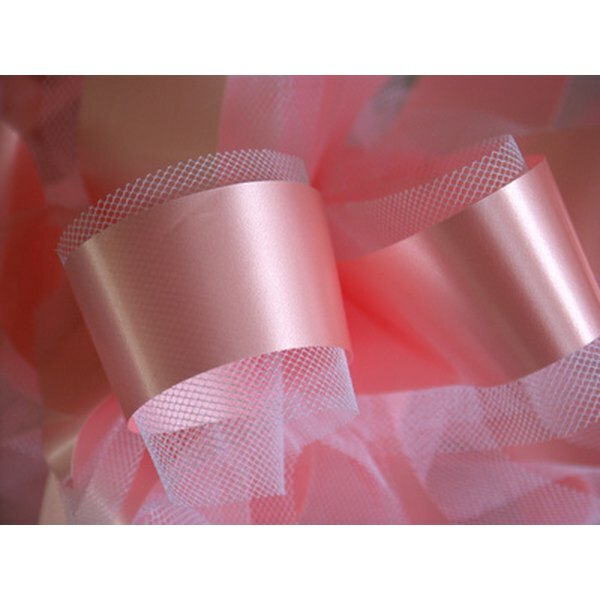 Tulle is a versatile decorating material that comes in many colors, and is useful for weddings and other special occasions. It can also lend elegance to any type of gathering, is simple to use and can be used to create different types of decorations. Tulle is an easy way to make chairs look elegant at a wedding, reception or other event. You can create a large bow from the tulle and hang it on a chair, or you can tie the tulle around the top of the chair using knots and leave some of the tulle hanging down. Alternately, use tulle as a chair cover, covering the top of the chair with tulle and tying it on with a coordinating ribbon. Wrap columns, banisters or staircase railings with tulle. This will add elegance to any room or party. Use a hot glue gun to embellish the tulle with bows and ribbons, artificial flowers or crystals to add something special to the tulle. For a holiday party, hang Christmas ornaments on red or green tulle. For weddings, use bows, lace or flowers to decorate the tulle. Decorate hanging light fixtures by tying tulle bows on or hanging tulle from the fixture. Tulle is a good way to soften a girl's bedroom. Hang tulle from the ceiling and use it as a canopy over a bed, or wrap it around a canopy to look romantic. Tulle can also be used on windows over curtains or wrapped around the top of the curtain rod for a special touch. Hang tulle bows around a mirror or on the wall, or wrap it around bedposts. An amazing way to change the atmosphere at any party or in any room is to hang tulle from the ceiling. Using nails or hooks, tulle can be draped loosely on the ceiling. To make the effect even more spectacular, use clear twinkle lights around or over the tulle to make a magical ceiling decoration. This works well for a prom or wedding reception. Dark-colored tulle with white lights looks like the nighttime sky,and any soft color of tulle will look dreamy and romantic.